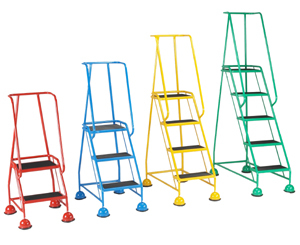 Great value retractable wheel safety steps for use in the workplace to gain access to those hard to reach shelves. Fitted with dome covered spring loaded swivel castors with non-marking tyres, these mobile safety steps combine maximum safety with easy movement to new locations. When weight is applied to a step, the whole unit presses down where a rolled bottom edge grips to the floor, ensuring the whole unit stays in place whilst in use.